Evil General Grievous is confirmed as leader of Count Dooku’s droid armies… but can Asajj Ventress and Durge step in? Chaos and bloodshed ensue when Republican commandos try to retrieve a diplomatic package for Chancellor Palpatine. Can Yoda do the business and single-handedly defend a small town from elimination? 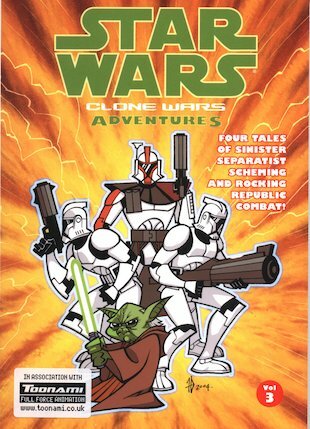 And is Jedi Master Plo Koon taking on too much when he swoops in to save a small squad of clones from certain doom? Four cracking cine-manga stories.